Vanessa: Have you ever dreamed of escaping reality, detoxing from technology or spending your days sipping on cocktails on the remote shores of a pristine island? If you have dreamed it, read on to discover where you can live it… for I can well and truly say I have been to paradise and back. To celebrate our one year wedding anniversary my dear husband, aka Mr M, surprised me with an 8 night getaway to Viwa Island Resort in Fiji. Located in the Yasawa group of islands, Viwa is a tropical island paradise with pure white beaches, crystal clear waters teaming with marine life and a resort that will welcome you in as part of the family leaving you in tears on your departure (true story). This posts varies from our usual, but unforgettable experiences and discoveries such as these should be shared. If you are looking for your next island getaway…this could it be it! We arrived at Viwa in the afternoon after our 30 minute sea plane transfer from Nadi. We were immediately greeted by one of the resort owners, Roy, along with other members of staff who presented us with hibiscus leis and guided us up to the main bure where refreshing welcome drinks were waiting for us. I had never experienced such a friendly, warm and energetic reception at any previous resort (anywhere in the world) and felt instantly welcomed into the Viwa Island Resort family. The resort has 11 bures on the island with a maximum capacity of 26 guests (over 16 years of age) at any one time. This creates a very intimate environment where guests can socialize as much (or as little) as they wish and the staff always greet and address you by name. We were staying in Bure 2 and very close to the main bure, which houses the bar, dining room, reception, small boutique, resort library and pool table. The bures are beach-facing, set back approximately 50 m from the shore. Each bure has its own deck with chairs perfect for admiring the view whilst escaping the heat of the afternoon sun. You also never need to worry about getting that perfect position at the beach as each bure has its own allocated day beds and shade right by the water. The only structure to our days during our stay was around food and happy hour..which suited us perfectly! This nightly event occurring between 6-8pm would see us and the other guest gather in the main bures for sunset cocktails. This was a great time to mix and mingle with the guests, staff and owners and the staff know how to mix a good cocktail. Being so remote, there is very little mobile coverage on the island, meaning there is hardly any reception, no free wifi i.e no facebook, so people are genuinely engaged with each other without the distraction of technology – a rare site these days! Admittedly I was a little apprehensive at first with the idea of eating at the same location for 8 days straight, but I soon discovered there was no need for worry. The resort offers a daily continental breakfast and hot cooked options (an option of either included as part of your stay… though additional items were very reasonably priced). The lunch menu is extensive and dinner changes daily and offers a great variety of dishes. I rarely ate the same thing twice…except a few stand out dishes which were too good not to. The meals were of very high quality both in standard and presentation, offering loads of fresh seafood dishes, traditional Fijian dishes and European cuisine. In 8 days there was not one dish I ate I didn’t enjoy which is a huge testament to the chef and his team. I won’t bore you with every meal I ate, but below are a few of the stand out dishes. Another daily aspect I loved was the welcome and farewell songs, where each evening at 8.30pm the resort staff would gather to welcome the new guests and farewell those that were leaving. The bula/welcome song was uplifting and a great way to really make the new guests feel at home. Equally, the Isa Lei farewell song was sombre and tugged at the heart-strings, particularly for those who were leaving that evening. One of the great things about the resort are the daily complimentary activities on offer which cater to various interests. It was very exciting to check the board each morning to see what activities were taking place that I could join in. Well structured, again around meal times, the activities, at the same set times each day, are arranged so you can do as much or as little as you want and still incorporate time to relax by the beach. Activities include hand line fishing, cooking lessons, historic hikes and village visits to name a few. One of the most memorable for me was visiting the local village, a mere 7-minute walk from the resort. Guided by the resorts activity director, Bar, we walked through the village observing the school, nurses station, desalination plant and general village life. Our anniversary happened to fall on Fiji’s national day of independence and we couldn’t have asked for a more memorable way to celebrate our first year of marriage! For the first time, the local village had been invited by the resort management to spend the morning at the resort. For many of the village children this was their first time seeing the resort and certainly the first time for all of them to swim in a pool. As an act of kindness and gratitude, the children performed a concert for the guests which was just beautiful to watch. We also played games together and the resort management organised lunch before they returned. That resort staff had the afternoon off to play games with the guests such as volleyball, tug of war and a relaxing drink of kava by the beach. That evening in celebration of Fiji Day, guests and staff joined together in a traditional Fijian buffet. Earlier that day the staff had prepared a ‘lovo’, a pit filled with hot stones, where they slow cooked a whole pig, chickens and local vegetables… the result was delicious. It was also very interesting to watch this process from start to finish… and of course taste the end result! This happened to be our last night on the island so the Isa Lei that evening was particularly teary as we felt so sad to be leaving the island and the new friends we had made. I could fill a page on all the wonderful comments I could make about the staff at this resort. Their friendly, caring attitudes and willingness to assist each guests in any way they can, makes this team of dedicated staff one of a kind. They were a major factor in what made our stay so enjoyable and so memorable. Equally the new owners, Roy and Louise, go above and beyond to ensure that their guests are happy and enjoying their stay. They are also doing great things to ensure the resort becomes self-sufficient and, from what I saw, are nurturing a wonderful relationship with the local villages. 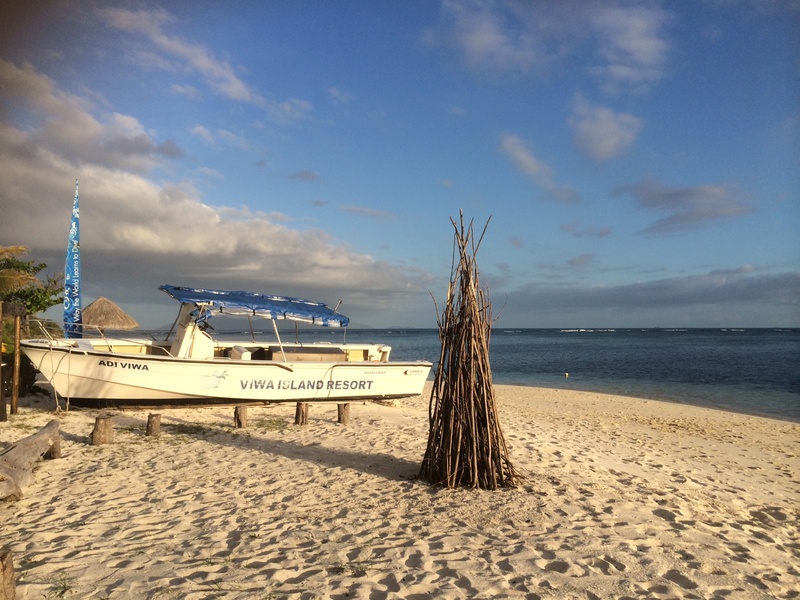 Viwa Island will always hold a special place in our hearts and is somewhere that I know we will return. I recommend it to anyone looking to really switch off and unwind in a tropical island paradise. You will return feeling re-energised, reset and already planning your return!